The delightful holiday resort town of Adra, the western-most coastal town in the province of Almeria, is surrounded by magnificent beaches and is rich in history, having been founded in the 8th century. Adra remains a working fishing harbour and early-rising visitors enjoy the daily dawn fish auctions and dining out at the many tempting seafood restaurants. The clean, neat town centre with its many squares and parks is split by the attractive Paseo de Natalio Rivas promenade. Sights to see include the Church of the Immaculate Conception, the Partridge Tower (which houses the tourist office), an historic restored mill and the town's interesting museum. Adra boasts the Poniente blue flag beach among its stretches of beautiful sandy shore, attracting hundreds of holidaymakers each year. Adra is a quiet, relatively undiscovered holiday destination, less expensive than the more famous, established Spanish resorts, and is a great option for relaxed family holidays. The little town is said to get more than 360 days of sun a year, making it a reliable hub for a beach holiday even outside of the hot summer months. Apart from a couple of tourist shops selling suntan lotion and beach-themed souvenirs, there is no shopping to speak of in Adra. There are, however, frequent markets and the daily ritual of bargaining over the fishermen's catch. Those who fancy a shopping spree should make the short trip to Almeria. 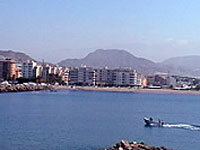 Head to the tapas bars on Paseo de los Tristes in the town centre, and along the beachfront. This is probably the tastiest and most authentic food in town - and it's free provided you're drinking. Restaurants are few and far between, and tend to be fairly expensive. Fresh seafood is the speciality. The cost of living in Adra is unusually low for Spain, and it is relatively cheap to buy fresh produce if you don't mind doing your own cooking. Adra has no nightlife to speak of, although it is less than one hour away from Almeria where there are some clubs and bars for nighttime revelry. The whole point of coming to Adra is to do as little as possible, so most activities are centred around the three main beaches: Poniente, the largest of the three and situated west of the harbor; San Nicolas; and Censo. One can also visit the charming 16th-century Parish of the Immaculate Conception and Church of Our Lady of Angustias. In June various bonfire festivals are held around Adra, making this a festive time to visit. Alternatively, the Museum of Adra provides visitors with an extensive look into the history of the town. Next door to the museum visitors to Adra can view the Molino de Lugar, a beautifully restored mill originally built in 1772. A short trip from the beach is the San Sebastian Hermitage which holds statues of Adra's two patron saints, Nicholas de Tolentino and the Virgin of the Sea. Although for many the laid-back and down-to-earth atmosphere of this sleepy resort town is its main appeal, Adra can be a little quiet and uneventful for those holidaymakers looking for a party.